I initially joined Facebook-- yes, I still keep calling it MyFace-- to better network with folks in the comedy biz. But lately I've been corresponding with my old classmates from Junior High, many of whom I haven't spoken to in nearly 30 years. It's been fun in that "we really don't have anything in common anymore" kind of way. We've been catching up, reminiscing and making fun of each others old hair styles. There's been lots of LOLs and OMGs and ROTFLs. 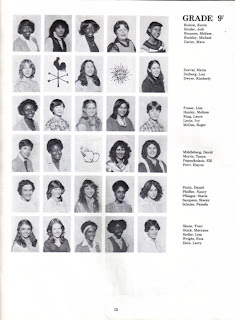 A Facebook Group was formed so I decided upload scanned photos of our old Yearbook. Apparently, I'm the only loser who held on to the damn thing so this has made me very popular. That's me in the lower left square. I cried when I wasn't allowed to have the photo retaken. Seeing it now makes me want to cry again. One of my male classmates told me that when his youngest teenage daughter saw my profile picture she said, "I know that lady!" 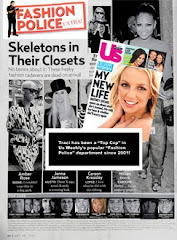 She then ran and grabbed her latest issue of Us Weekly. Apparently, his cool quotient has risen now that he knows a "celebrity." I hope she doesn't realize that I'm just an unpaid writer who makes fun of celebrities. Close enough, I suppose. I think most of the pictures from that era were taken with a DISC camera. Either that or my mother was secretly drinking. Nothing else explains the poor quality of the images from my teenage years. 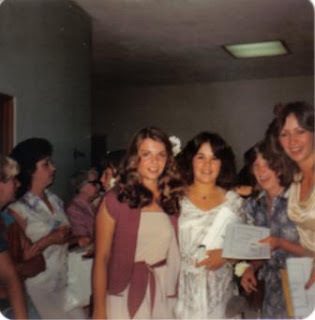 Here is a somewhat decent photo from my 9th grade graduation. That's me stylin' on the left. What non-Hawaiian 14-year-old would have the guts to wear a flower in her hair when hanging with other teens? It's no wonder I'm one of the Fashion Police. To the far right is my Greek friend, Elli who was the late 1970's equivalent of my BFF. When I ran for school president, I made her my campaign manager. Her sole job was to wear tight jeans or a short skirt at all of our public appearances. I won in a landslide. Two years later, she was living in Greece with her ultra-macho, mustachioed husband. They now have four kids. I had lunch with her a few years ago when she came back to America for her niece's wedding. She still looks good in tight pants. HD has made picture taking horrible. BRING BACK THE DISC!! I agree. It's been two years at least since I've had a good picture taken of me. I keep saying it's my age. Brian insists it's technology.